Hearing impairment or loss is the reduction in hearing sensitivity, which can be due to a number of different factors. This implies that the sound intensity of some or all frequencies has to be increased, for the ear to be able to perceive all sounds. Do you need ear checkup? When there is pain or ear discharge or vertigo-sensation of imbalance or ringing sound in the ear or damage to any part of the ear like; outer, middle or inner ear, a Hearing Test is necessary to rule out hearing loss. When you have to speak a little bit louder than normal to get his/her attention you will need to go for a check up. Unilateral hearing loss(one side hearing loss)- a rare condition in which a person may hear normally in one ear while the other ear may suffer from Mild to Profound hearing loss. Hearing Loss is progressive. When you do not take timely action to correct the problem, hearing will deteriorate. Mild Loss is when you cannot hear the wind blowing and the rustle of the leaves on the trees. Moderate Loss is when you cannot hear or understand normal speech. Severe Loss is when a person has to shout for you to hear. Profound Loss is when a person is unable to hear loud noise. Conductive Hearing Loss can be treated medically or surgically, Hearing Loss is caused by wax block, glue ear, perforation in the tympanic membrane, Eustachian tube block, inflammation of the middle ear, discontinuity / less elasticity in ossicular bone chain. Where medicine or surgery cannot solve the problem, people with Conductive Hearing Loss can often be helped with Hearing Aids. 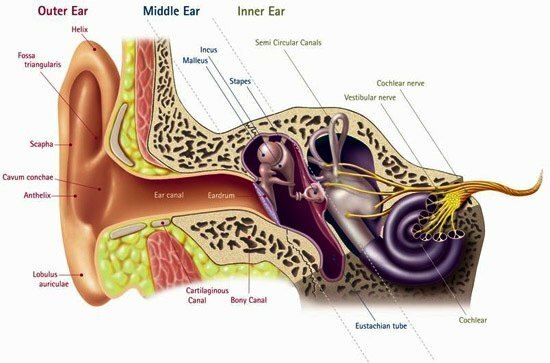 Sensorineural Hearing Loss is nerve deafness, caused by some abnormality of the Cochlea, auditory nerve or the hearing portion of the brain. 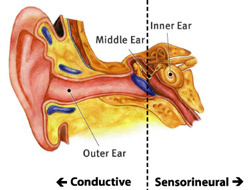 Most Sensorineural Hearing Loss is caused by defects or damage to the Cochlea – Retro Cochlear because of age, hypertension, excessivenoise, ototoxic drugs, congenital, hereditary, strain, environmental causes etc. Mixed hearing loss is a combination of sensorineural and conductive hearing loss. It results from problems in both the inner and outer or middle ear. Treatment options may include medication, surgery, or hearing aids. Tinnitus means “to tinkle or to ring like a bell”. Tinnitus is a subjective experience where one hears a sound when no external physical sound is present. Some call it “head noises” or “ear-ringing”. Noises in the ear or head possibly of pulsation, ringing, hissing or buzzing usually associated with some Hearing Loss. Main causes are Otosclerosis, Wax, Hypertension, nerve diseases, tumours, over smoking, drug and alcohol, menieres disorder, perforation in tympanic membrane etc. For certain cases there is no cure, Hearing Aid can be a substantial solution.